We have not made any plans for afternoon activities. With 12 cars, we don’t all need to do the same. The possibilities we have thought of are shown below. For more information on these, click on the links. If you know of any other interesting possibilities, please tell me so that I can add them to this page. The easiest thing to do is to spend the afternoon in the hotel gardens, or in its swimming pool. Sidmouth has an interesting museum, with some information relevant to Sidholme. There are two attractive and very easy walks in Sidmouth itself. The Esplanade is an easy stroll, with the Connaught Gardens at the far end. 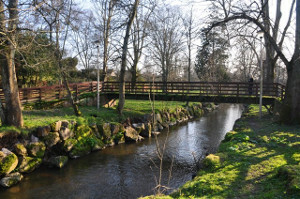 Just 5 minutes walk from the hotel is The Byes, a linear park following the course of the River Sid. Nearby to the west is the Bicton Park Botanical Garden. This is more than just a botanical garden, having a motor museum, a countryside museum, and a narrow-gauge railway. Budleigh Salterton is an attractive resort to the west of Sidmouth. The Donkey Sanctuary lies just outside Branscombe. It has a visitor centre which includes a restaurant. Outside the nearby village of Beer, you will find the Beer Quarry Caves, where you can have a guided tour of a 2000-year-old quarry. The village of Seaton has a Tramway, on which you can take a 3 mile journey. If you still have the energy, you could take up Linda’s suggestion of the coastal walk from Beer to Seaton. Charmouth might be worth a visit for the beach or a café. Lyme Regis is an attractive small town, with the well-known Cobb and a fossil museum.